Explore top destinations around Phang Nga Bay on a full-day tour by boat from Phuket. Visit sea caves, sandy beaches, jungle-clad islands, and fishing villages, and pass by landmarks like James Bond Island. 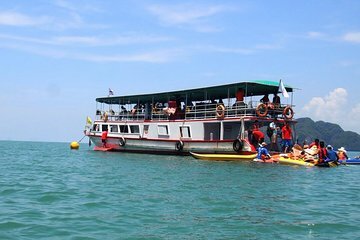 Have time to swim and kayak at scenic spots on a tour that includes a seafood buffet lunch, snacks, guide, and round-trip transfers from Phuket. You'll ride in comfort on a large boat, then get close to choice destinations in smaller boats.